JAKWV installs officers at annual New Year’s luncheon. 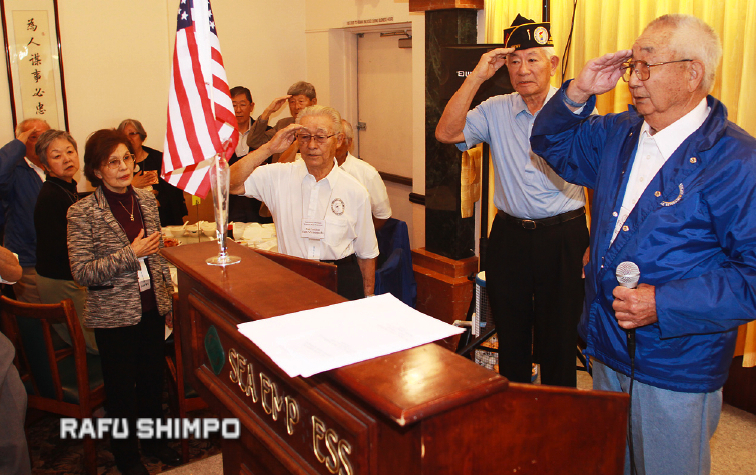 Frank Tanaka salutes as he leads the Japanese American Korean War Veterans in the Pledge of Allegiance at the organization’s annual New Year and officer installation luncheon on Jan. 16 in Gardena. GARDENA — Starting his second year as president of the Japanese American Korean War Veterans, Tohoru Isobe recalled the famous words spoken by Gen. Douglas MacArthur in his farewell address to Congress in 1951. 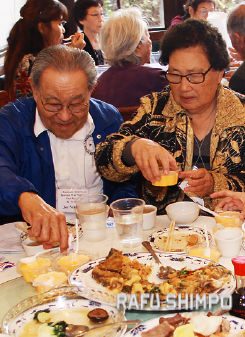 There was no fading at the annual JAKWV installation and New Year’s celebration held Jan. 16 as a gathering of more than 120 filled the tables of the Sea Empress in Gardena. JAKWV board member Joe Sakamaki and his wife Yone enjoy the Chinese banquet. While it was a joyous occasion, the memories and hardships of war were not forgotten. A single table was set in front of the room with a red rose and a slice of lemon on the plate. “It is set for one, symbolizing the members of the military who are missing in action. We call them comrades,” stated Mitchell Sakado, JAKWV board member. More than 6,000 Japanese Americans served in the Korean War, including 254 who were killed in action. Frank Tanaka, a new JAKWV board member, served nine months in combat with the 15th Regimental Combat Team. He is the last survivor of nine Japanese Americans in the Army Third Division during the war. “I was lucky, not a scratch. Except I can’t hear out of my right side,” Tanaka said. A Nebraska native, Tanaka was commander of the San Fernando Valley Nisei Post 4140 until it folded last year. He said his service in veterans groups is a tribute to his war buddy, Pfc. Joichi Yamashita, who perished in an ambush in North Korea on Dec. 9, 1952. “I had to go see his mother and father and I made a promise to myself that his name would never be forgotten,” Tanaka said. JAKWV holds an annual raffle that has raised $360,000 in the past 20 years for the maintenance of the Japanese American War Memorial Court at the Japanese American Cultural and Community Center in Little Tokyo. The name of Pfc. Yamashita is among those memorialized on the wall. David Miyoshi, JAKWV legal counsel and a Vietnam veteran, performed the oath of office and praised the leadership of the JA veterans. “JAKWV is the best organization. It is one of the most active Japanese American veterans associations in the country,” Miyoshi said. Consul Byun Byun-myong Kim expressed the gratitude of people of South Korea for the sacrifices of the Japanese American veterans. “It is an honor to stand before heroes of the Korean War,” Kim said. Other dignitaries in attendance included Deputy Consul General Izuru Shimmura, Sgt. Steve Mick of Redondo Union High School Marine Jr. ROTC and Everett Wong of the Department of Veterans Affairs. Hong Ki Park, president of the Korean Veterans Association, reminded the gathering of the ongoing conflict between North and South Korea. Although an armistice agreement was signed, ending the war on July 27, 1953, a final peace settlement has yet to be achieved. Park expressed his belief that the two Koreas will one day be reunited. “Someday the people will have an uprising. Korean veterans, stay healthy, wait for the day of unification,” Kim exhorted. 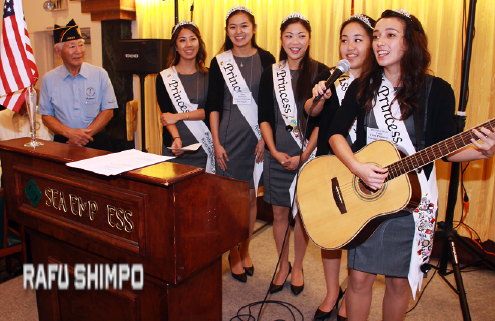 Nisei Week First Princess Veronica Ota on guitar leads the crowd in “God Bless America.” She is joined by Nisei Week Court members (from left) Michelle Hanabusa, Camryn Sugita, Tamara Teragawa and Karen Mizoguchi.